The conference took place from June 19th to June 23rd and was organised by Indiana University, Bloomington in conjunction with the Network Science Society. It was the 12th annual instalment of NetSci, which has been organised around the world, bringing together network scientists from a wide range of disciplines. This year’s conference was attended by 680 participants. 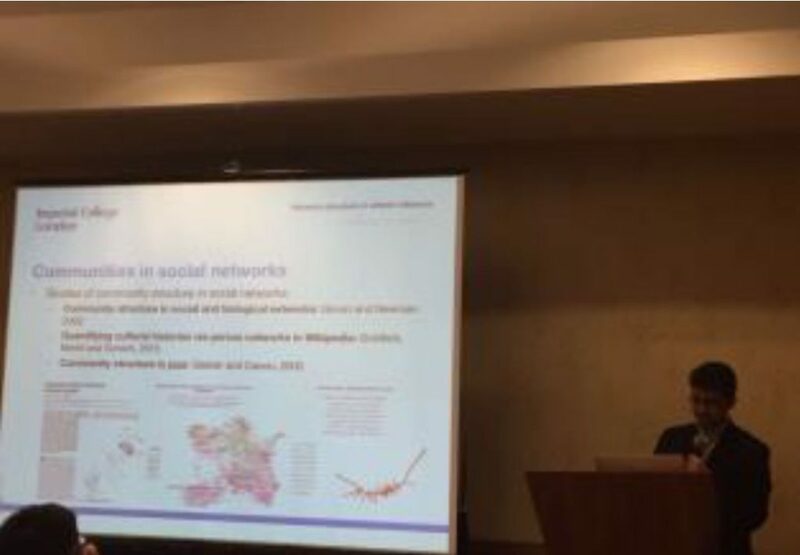 My participation in the conference consisted of a talk on a satellite meeting centred around the theme of “Social Influence in Networks” on Monday, June 19th and a poster contribution, whose main plenary presentation was Wednesday, June 21st. My talk was entitled “Network structure in artistic influence”, and was based on one of the two main projects of my PhD research, where I form a social network of Western art painters and am using community detection methods, standard and generalised centrality measures, and measures of brokerage to identify and quantify artistic influence. What makes me particularly motivated about this project is how it finds a novel area where networks become relevant and can be used to bridge yet another discipline with applications of physics. The talk also got a few interesting questions and comments about my definition and construction of the network, which I can certainly use in later work. My poster, entitled “Preferential attachment in container shipping” was based on the second main project of my PhD work, which is modelling container shipping networks by models incorporating the concept of exogenous intrinsic fitness. The objective is to understand how a port’s attractiveness impacts its capability to attract edges in a growing network, which in turn motivates the more theoretical discussion of how a latecomer node in a growing network can depend on its fitness to eventually dominate the network. My work attracted interest from young researchers who were working with the fitness model theoretically, and mainly from a post-doc from Dalian University in China, who was also working on container shipping networks and found the inclusion of fitness quite promising. Apart from presenting my own work, I had the opportunity to listen to world authorities on the field of networks, such as A.L. Barabási, S. Borgatti, A. Clauset and R. Lambiotte. Possibly one of the most interesting talks I heard in the conference was by one of the youngest authorities in networks, D. Bassett, whose applications of networks in neuroscience I found fascinating and deeply inspiring. I was also delighted to meet other young researchers in the field of networks, whose community drive definitely seems to keep the field growing. I am deeply grateful to the IOP, and in particular the Nonlinear and Complex Physics Group for their very significant contribution towards my travel costs, which definitely made my attendance of NetSci 2017 possible. I was also quite honoured to be able to acknowledge the contribution on my talk and poster, making me feel deeply integrated within the physics community of the UK. Thank you for making this possible. From telecommunication networks to social networks and gene regulatory networks, network science is now routinely applied in a wide range of fields. NetSci has emerged as the main annual conference for the network science community. NetSci 2017 was the 12th edition of the conference and was held in Indianapolis, USA, with over 600 attendees. The highly interdisciplinary nature of network science was reflected in the backgrounds of the attendees which covered a wide range of disciplines including physics, mathematics, computer science, engineering, biological sciences, social sciences and the humanities. The event began with two days of satellite meetings, covering a diverse range of topics from Machine Learning in Network Science to Urban networks and the Statistical Physics of Financial and Economic networks. On the first morning, I attended the Network Medicine satellite on ‘Quantitative interactome and multilayer networks taking medicine beyond the genome’. I particularly enjoyed the keynote lecture given by Prof. Nitesh Chawla on his work trying to go from disease centred medicine to patient focused medicine, combining different data types to predict a patients’ susceptibilities to diseases. His comments that ‘maths is easier than people’ and that often the difficulties lie in the nuances of obtaining and understanding the data resonated strongly with my own research. On Tuesday, I attended the Network Neuroscience satellite, which was the first edition of this satellite meeting and started with an excellent keynote talk from Prof. John Beggs. Prof. Beggs discussed his work studying the functional connectivity of around 300 neurons and presented intriguing results suggesting that 20% of neurons are responsible for around 70% of information transfer. The rest of the morning provided an opportunity to learn more about different methods and data available, for example data from the Allen Brain Institute mapping the mouse brain in unprecedented detail. 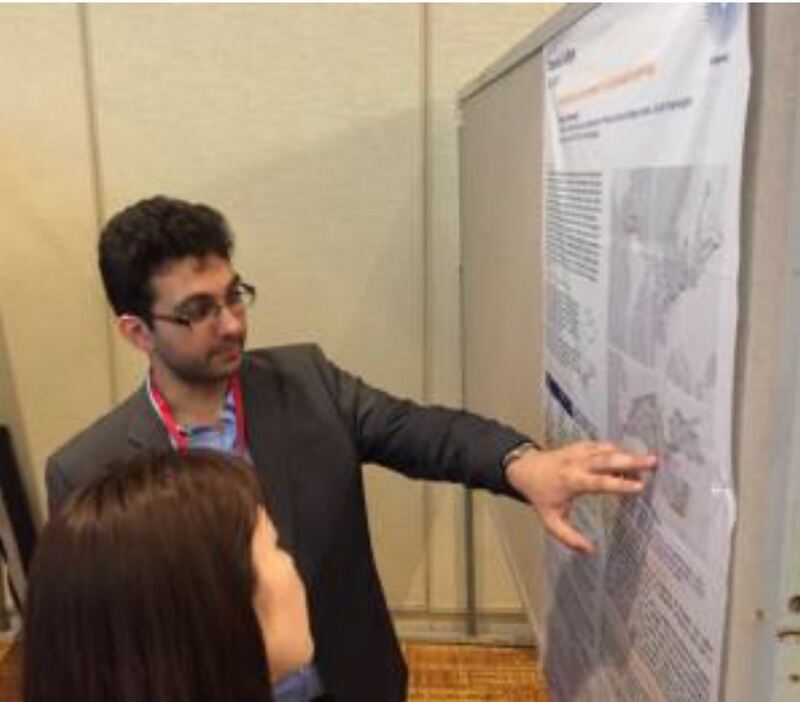 In the afternoon, I presented a poster on my work so far combining graph theory and machine learning approaches to diagnose and predict schizophrenia as part of the PSYSCAN project. Whilst this work is still ongoing, it was extremely helpful to get feedback on the various approaches we are taking and I came away with several ideas for future directions. The main part of the conference began on Wednesday, with a keynote from Prof. Dani Bassett on her work on a range of structural and functional brain networks. In the afternoon, I gave a talk on my research using network motifs (small subgraphs of networks) to study the key driving factors underlying the global topological properties of functional MRI brain networks. The rest of the conference covered a wide range of talks and discussions, including for example the challenges around defining network measures to fully exploit the characteristics of a problem but not overfitting a particular dataset. The networking sessions provided great opportunities to meet other researchers in the field and I was able to meet many brain network researchers for the first time. At the end of the conference, I also took opportunity to visit Prof. Olaf Sporns’ lab in nearby Bloomington. The group were extremely welcoming and the visit provided an ideal opportunity to discuss my research in more detail with group members and to discuss how some of the methods developed in Prof. Sporns’ group could be applied to the schizophrenic datasets I am working on as part of PSYSCAN (for example work on path ensembles by Dr Andrea Avena-Koenigsberger). Overall the conference succeeded in bringing together network scientists from a wide range of disciplines and gave me many ideas to further my own research. The conference organisers should also be commended on the number of female speakers; with over 50% of keynote talks given by women this was certainly one of the most forward-thinking conferences I have attended.